An environmentally-safe and pesticide-free approach for the control of Asian tiger mosquito infestations in Southern California. In the Sterile Male Tiger Mosquito Pilot Program, Vector Control will release sterile male Asian tiger mosquitoes (Aedes albopictus) in a localized area of South El Monte. Male mosquitoes do not bite and will mate with female tiger mosquitoes in the infestation zone. Eggs laid by these mated female mosquitoes will be sterile and will not hatch. The released males will die soon after mating. This program will show how well the control strategy can contribute to our overall Asian tiger mosquito control program. This technique will only target the Asian tiger mosquitoes. Asian tiger mosquitoes have taken broad hold in an increasing number of neighborhoods since they were detected in 2011. For four years, they have posed a potential public health risk to millions of people living in Los Angeles County. As they expand their presence, they increase the risk for local disease outbreaks of dengue and chikungunya. While most cases are outside of the United States, residents traveling to areas with local transmission can come back infected. Infected travelers entering an area where Asian tiger mosquitoes are present can start a local outbreak of these debilitating illnesses. LA Daily News – Cases of rare mosquito-borne disease reported in Los Angeles County. 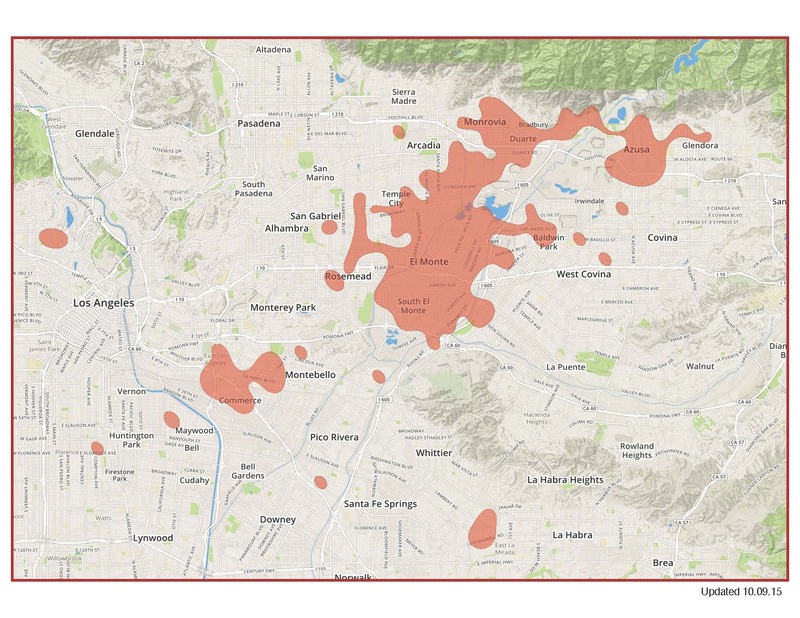 There have been travel-related cases of dengue and chikungunya in and near areas that are known to have Asian tiger mosquitoes in Los Angeles County. If conditions are right, this can expose communities to local outbreaks. By reducing the population of Asian tiger mosquitoes, we reduce the threat of local transmission of exotic diseases like dengue and chikungunya. Chikungunya (Chik-gun-GOON-ya) is a debilitating and painful, but rarely fatal mosquito-transmitted virus. Since 2013, there are 1.4 million reported cases from South America, the Caribbean and Mexico. In 2014, there were 50 confirmed cases of U.S. travelers coming back to Los Angeles County with the virus. Most people (80%) bitten by an infected mosquito will get sick. There is no available vaccine for chikungunya. Read more about Chikungunya on CDC’s website. Learn more about how Chikungunya affected more than one million people around the world in the past few years — Science News. Note: The map in the article has not been updated to show that we, in California, have the mosquito that can transmit chikungunya.